, a learned prelate, and deservedly reputed one of the fathers of the English church, was descended from an ancient family at Buden in Devonshire, where he was born May 24, 1522. After learning the rudiments of grammar under his maternal uncle Mr. Bellamy, rector of Hamton, and being put to school at Barnstaple, he | was sent to Oxford, and admitted a postmaster of Mertori college, in July 1535, under the tuition of Parkhurst, afterwards bishop of Norwich, who entertained a very high opinion of him from the beginning, and had great pleasure in. cultivating his talents. After studying four years at this college, he was, in August 1539, chosen scholar of Corpus Chnsti college, where he pursued his studies with indefatigable industry, usually rising at four in the morning, and studying till ten at night by which means he acquired a masterly knowledge in most branches of learning but, taking too little care of his health, he contracted such a cold as fixed a lameness in one of his legs, which accompanied him to his grave. In Oct. 1540, he proceeded B.A. 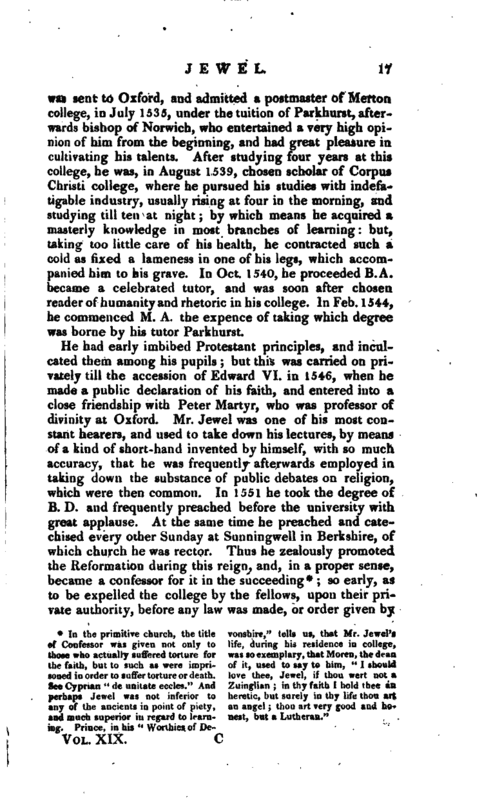 became a celebrated tutor, and was soon after chosen reader of humanity and rhetoric in his college. In Feb. 1544, he commenced M. A. the expence of taking which degree was borne by his tutor Parkhurst. so early, as to be expelled the college by the fellows, upon their private authority, before any law was made, or order given by | queen Mary. On this occasion, they had nothing to object against him, but, 1, His followiug of Peter Martyr. 2. His preaching some doctrines contrary to popery. 3. His taking orders according to the laws then in force. 4. 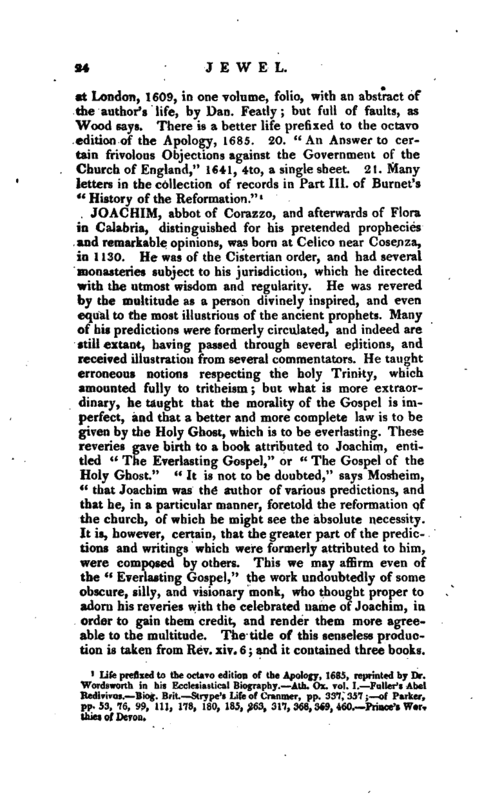 And, according to Fuller, his refusal to be present at mass, and other popish solemnities. At his departure he took leave of the college in a Latin speech, full of pathetic eloquence. Unwilling, however, to leave the university, he took chambers in Broadgate-halJ, now Pembroke college, where many of his pupils followed him, besides other gentlemen, who were induced by the fame of his learning to attend his lectures. But the strongest testimony to his literary merit was given by the university, who made him their orator, and employed him to write their first congratulatory address to her majesty. Wood indeed observes, that this task was evidently imposed upon him by those who meant him no kindness; it being taken for granted, that he must either provoke the Roman catholics, or lose the good opinion of his party. 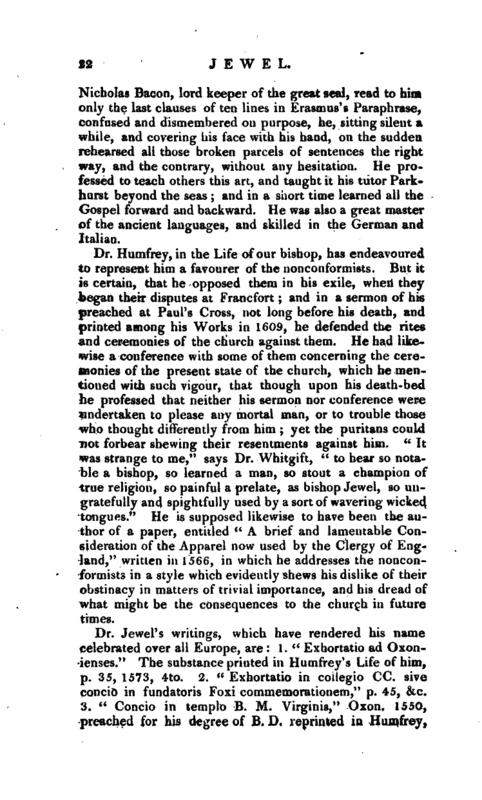 If this be true, which is probable enough, he had the dexterity to escape the snare; for the address, being both respectful and guarded, passed the approbation of Tresham the commissary, and some other doctors, and was well received by the queen; but his latest biographer attributes the appointment solely to the opinion the university had of him as an elegant writer, and therefore the most fit to pen an address on such an occasion. Burnet informs us, that her majesty declared, at her accession, that she would force no man’s conscience, nor make any change in religion. 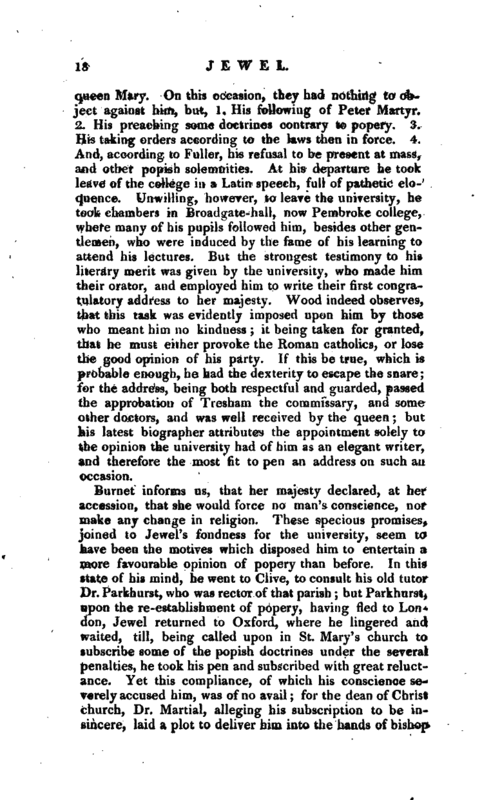 These specious promises, joined to Jewel’s fondness for the university, seem to have been the motives which disposed him to entertain a more favourable opinion of popery than before. In this state of his mind, he went to Clive, to consult his old tutor Dr. Parkhurst, who was rector of that parish; but Parkhurst, upon the re-establishment of popery, having fled to London, Jewel returned to Oxford, where he lingered and waited, till, being called upon in St. Mary’s church to subscribe some of the popish doctrines under the several penalties, he took his pen and subscribed with great reluctance. Yet this compliance, of which his conscience severely accused him, was of no avail; for the dean of Christ church, Dr. 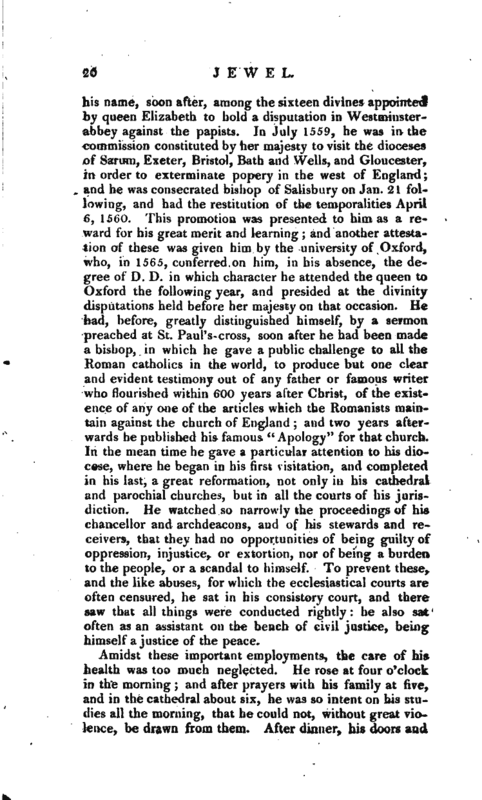 Martial, alleging his subscription to be insincere, laid a plot to deliver him into the hands of bishop | Bonner; and would certainly have caught him in the snare, had he not set out the very night in which he was sent for, by a bye-way to London. He walked till he was forced to lay himself on the ground, quite spent and almost breathless: where being found by one Augustine Berner, a Swiss, first a servant of bishop Latimer, and afterwards a minister, this person provided him a horse, and conveyed him to lady Warcup, by whom he was entertained for some time, and then sent safely to the metropolis. Here he lay concealed, changing his lodgings twice or thrice for that purpose, till a ship was provided for him to go abroad, together with money for the journey, by sir Nicholas Throgmorton, a person of great distinction, and at that time in considerable offices. 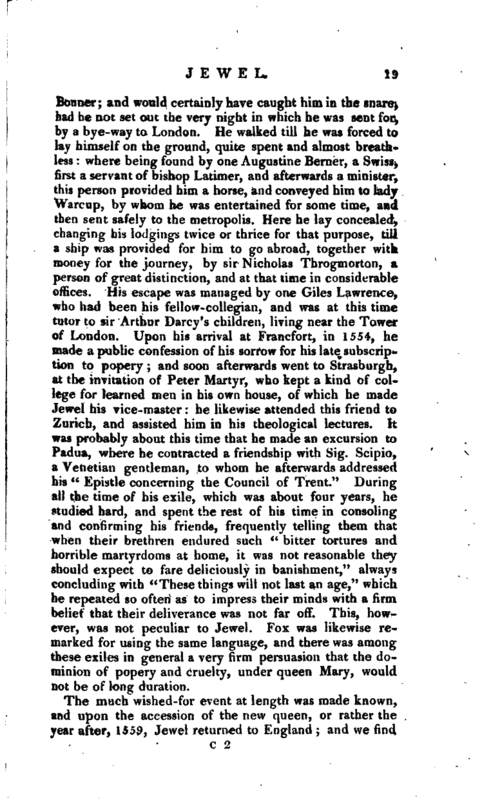 His escape was managed by one Giles Lawrence, who had been his fellow-collegian, and was at this time tutor to sir Arthur Darcy’s children, living near the Tower of London. Upon his arrival at Francfort, in 1554, he made a public confession of his sorrow for his late subscription to popery; and soon afterwards went to Strasburgh, at the invitation of Peter Martyr, who kept a kind of college for learned men in his own house, of which he made Jewel his vice-master: he likewise attended this friend to Zurich, and assisted him in his theological lectures. It was probably about this time that he made an excursion to Padua, where he contracted a friendship with Sig. Scipio, a Venetian gentleman, to whom he afterwards addressed his “Epistle concerning the Council of Trent.” During all the time of his exile, which was about four years, he studied hard, and spent the rest of his time in consoling and confirming his friends, frequently telling them that when their brethren endured such “bitter tortures and horrible martyrdoms at home, it was not reasonable they should expect to fare deliciously in banishment,” always concluding with “These things will not last an age,” which he repeated so often as to impress their minds with a firm belief that their deliverance was not far off. This, however, was not peculiar to Jewel. Fox was likewise remarked for using the same language, and there was among these exiles in general a very firm persuasion that the dominion of popery and cruelty, under queen Mary, would not be of long duration. The much wished-for event at length was made known, and upon the accession of the new queen, or rather the year after, 1559, Jewel returned.to England; and we find | his name, soon after, among the sixteen divines appointed hy queen Elizabeth to hold a disputation in Westminsterabbey against the papists. In July 1559, he was in the commission constituted by her majesty to visit the dioceses of Sarum, Exeter, Bristol, Bath and Wells, and Gloucester, in order to exterminate popery in the west of England; and he was consecrated bishop of Salisbury on Jan. 21 following, and had the restitution of the temporalities April 6, 1560. This promotion was presented to him as a reward for his great merit and learning; and another attestation of these was given him by the university of Oxford, who, in 1565, conferred on him, in his absence, the degree of D. D. in which character he attended the queen to Oxford the following year, and presided at the divinity disputations held before her majesty on that occasion. He had, before, greatly distinguished himself, by a sermon preached at St. Paul’s-cross, soon after he had been made a bishop, in which he gave a public challenge to all the Roman catholics in the world, to produce but one clear and evident testimony out of any father or famous writer who flourished within 600 years after Christ, of the existence of any one of the articles which the Romanists maintain against the church of England; and two years afterwards he published his famous “Apology” for that church. In the mean time he gave a particular attention to his diocese, where he began in his first visitation, and completed in his last, a great reformation, not only in his cathedral and parochial churches, but in all the courts of his jurisdiction. He watched so narrowly the proceedings of his chancellor and archdeacons, and of his stewards and receivers, that they had no opportunities of being guilty of oppression, injustice, or extortion, nor of being a burden, to the people, or a scandal to himself. To prevent these, and the like abuses, for which the ecclesiastical courts are often censured, he sat in his consistory court, and there saw that all things were conducted rightly: he also sat often as an assistant on the bench of civil justice, being himself a justice of the peace. Amidst these important employments, the care of his health was too much neglected. He rose at four o’clock in the morning; and after prayers with his family at five, and in the cathedral about six, he was so intent on his studies all the morning, that he could not, without great violence, be drawn from them. After dinner, his doors and | ears were open to all suitors; and it was observed of him, as of Titus, that he never sent any sad from him. Suitors being thus dismissed, he heard, with great impartiality and patience, such causes debated before him, as either devolved on him as a judge, or were referred to him as an arbitrator; and, if he could spare any time from these, he reckoned it as clear gain to his study. About nine at night, he called all his servants to an account how they had spent the day, and then went to prayers with them: from the chapel he withdrew again to his study, till near midnight, and from thence to his bed; in which when he was laid, the gentleman of his bed-chamber read to him till he fell asleep. 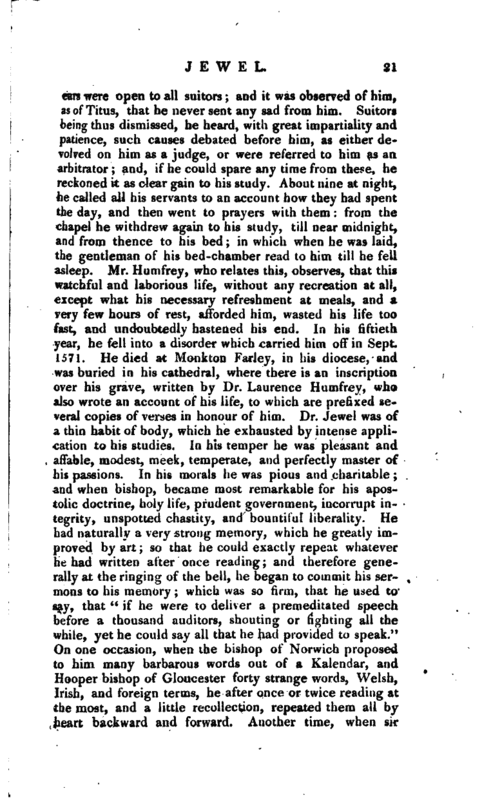 Mr. Humfrey, who relates this, observes, that this watchful and laborious life, without any recreation at all, except what his necessary refreshment at meals, and a very few hours of rest, afforded him, wasted his life too fast, and undoubtedly hastened his end. In his fiftieth year, he fell into a disorder which carried him off in Sept. 1571. He died at Monkton Farley, in his diocese, and was buried in his cathedral, where there is an inscription over his grave, written by Dr. Laurence Humfrey, who also wrote an account of his life, to which are prefixed several copies of verses in honour of him. Dr. Jewel was of a thin habit of body, which he exhausted by intense application to his studies. In his temper he was pleasant and affable, modest, meek, temperate, and perfectly master of his passions. In his morals he was pious and charitable; and when bishop, became most remarkable for his apostolic doctrine, holy life, prudent government, incorrupt integrity, unspotted chastity, and bountiful liberality. He had naturally a very strong memory, which he greatly improved by art so that he could exactly repeat whatever he had written after once reading and therefore generally at the ringing of the bell, he began to commit his sermons to his memory; which was so firm, that he used to say, that “if he were to deliver a premeditated speech before a thousand auditors, shouting or fighting all the while, yet he could say all that he had provided to speak.” On one occasion, when the bishop of Norwich proposed to him many barbarous words out of a Kalendar, and Hooper bishop of Gloucester forty strange words, Welsh, Irish, and foreign terms, he after once or twice reading at the most, and a little recollection, repeated them all by heart backward and forward. Another time, when sir | Nicholas Bacon, lord keeper of the great seal, read to him only the last clauses of ten lines in Erasmus’s Paraphrase, confused and dismembered on purpose, he, sitting silent a while, and covering his face with his hand, on the sudden rehearsed all those broken parcels of sentences the right way, and the contrary, without any hesitation. He professed to teach others this art, and taught it his tutor Parkhurst beyond the seas; and in a short time learned all the Gospel forward and backward. He was also a great master of the ancient languages, and skilled in the German and Italian. Dr. Humfrey, in the Life of our bishop, has endeavoured to represent him a favourer of the nonconformists. But it is certain, that he opposed them in his exile, when they began their disputes at Francfort; and in a sermon of his preached at Paul’s Cross, not long before his death, and printed among his Works in 1609, he defended the rites and ceremonies of the church against them. He had likewise a conference with some of them concerning the ceremonies of the present state of the church, which he mentioned with such vigour, that though upon his death-bed he professed that neither his sermon nor’conference were undertaken to please any mortal man, or to trouble those who thought differently from him; yet the puritans could not forbear shewing their resentments against him. 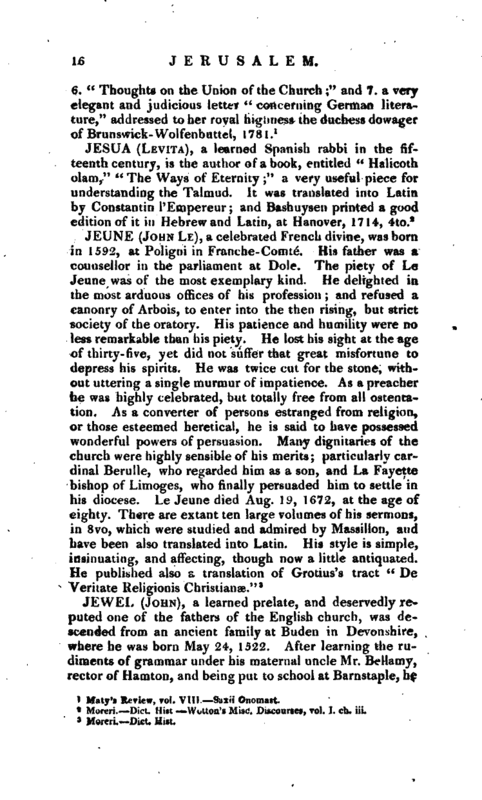 “It was strange to me,” says Dr. Whitgift, “to hear so notable a bishop, so learned a man, so stout a champion of true religion, so painful a prelate, as bishop Jewel, so ungratefully and spightfully used by a sort of wavering wicked tongues.” He is supposed likewise to have been the author of a paper, entitled “A brief and lamentable Consideration of the Apparel now used by the Clergy of England,” written in 1566, in which he addresses the nonconformists in a style which evidently shews his dislike of their obstinacy in matters of trivial importance, and his dread of what might be the consequences to the church in future times. 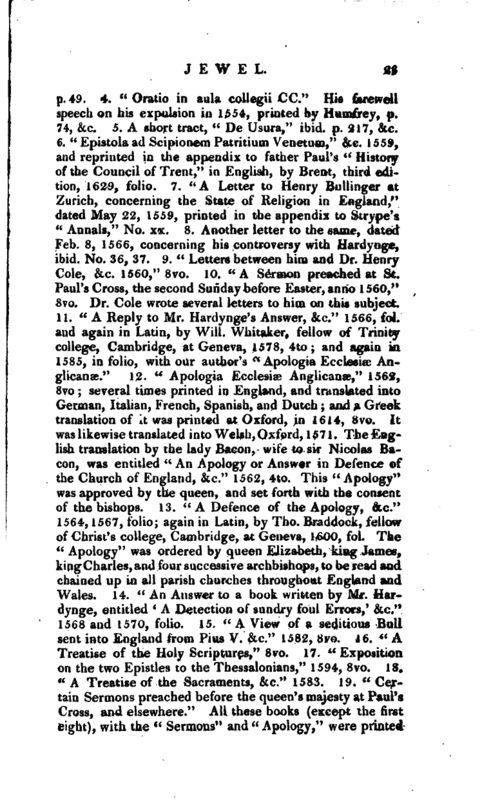 Life prefixed to the octavo edition of the Apology, 1685, reprinted by Dr. Wordsworth in his Ecclesiastical Biography. —Ath. Ox. vol. I. Fuller’s Abel Redivivus. Biog. Brit. —Strype’s Life of Cranmer, pp. 337, 357; of Parker, pp.53, 76, 99, 111, 178, 180, 185, 263, 317, 368, 369, 460. Prince’s Worthies of Devon.